Following federal government and larger States, ACT government is the latest convert to the cause of liberating vast holdings of spatial and non-spatial data in hope of invigorating local business to develop innovative solution and use the data for better decision making. And in the process, to stimulate economic activity and increase the number and quality of services offered to the local community. Built on Socrata platform dataACT is an open data service initiative that will enable individuals, businesses and people in the public sector to access, explore and build upon existing government data sets. dataACT has three core components which make it probably the most functional of all the initiatives in Australia. In particular, data is available in a machine readable and consistent range of data formats. This enables users to download static datasets in ready to use formats (eg. JSON but unfortunately, stopping short of being a dynamic web service). Secondly, the platform includes some basic data visualisation tools to make graphs or maps that can be embedded on external websites. This enables the creation of customised views of datasets for particular community needs or specific initiatives. However, the most exciting news is that data is uploaded from across the ACT Public Service through data integration systems that will update individual datasets appropriately. So, there is a commitment from day one to keep the data up to date. Initial set of released data is only a teaser but it is a good start. 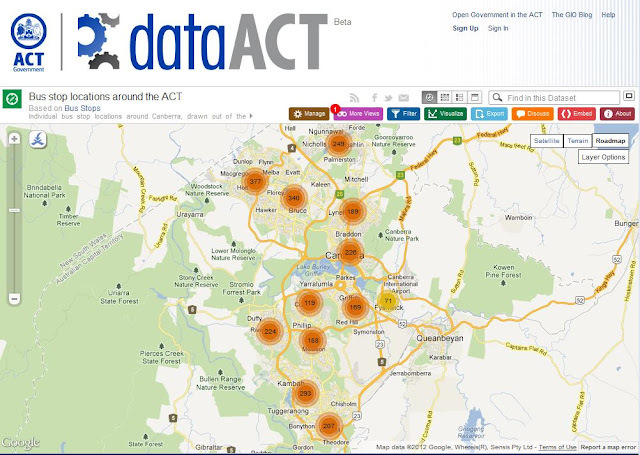 Let’s hope that the ACT government will not back on its commitment to the project and take a leading role in liberating the data that would really make a difference – for the local spatial community it means access to street data, cadastre information, address files and/or geocoding service, property transactions data (current and historical), 2m contours / DEM, topographic data, tourism database and high resolution imagery over the Territory. Don’t get me wrong. There was a time when a release of information on “toilet locations” generated a furore (and many goods apps were created as the result) but if the expectation is to make a significant and lasting economic impact, more useable data needs to be put in the public domain. Other data liberation and spatial data infrastructure initiatives seem to be fading fast after the initial flurry of activities, including myriad of hack-a-tons with rich prizes for participants. It is, after all, a hard work which requires more than just “sticking a few csv files on a web page” and hoping for the best. Let’s be brutally honest about it, it would be hard to name a single “public data mart” initiative in Australia that can really claim a success so, there is a big opportunity for dataACT to demonstrate how it should be done. What's the benefit of gov data warehouses?